(Bloomberg) -- New airplanes with spartan quarters appear to offer the greatest fuel efficiency when crossing the Atlantic. So enjoy that new plane smell as your knees buckle—you’re doing your part to fight climate change. 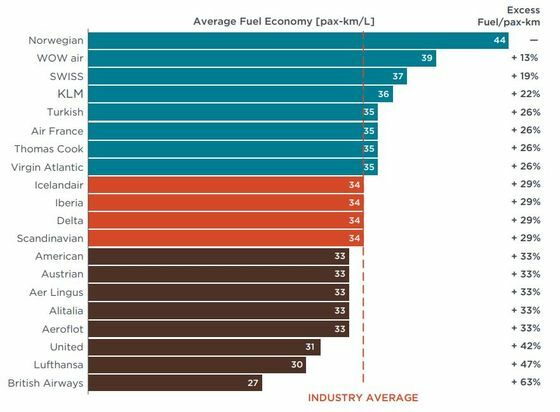 Among 20 airlines that traverse North Atlantic routes, Norwegian Air Shuttle ASA ranked as the most fuel-efficient last year, with British Airways the least, as measured by passenger-kilometers per liter of jet fuel, according to a report from the International Council on Clean Transportation (ICCT). Norwegian has incorporated a heavy mix of Boeing Co.’s 787 Dreamliner aircraft as part of its aggressive expansion into the U.S. The metric also speaks to the abundance of premium cabins: Norwegian and WOW Air, atop the list, have little in the way of luxury; at the other end of the efficiency ranks, British Airways and Deutsche Lufthansa AG fly ample business- and first-class seats on large, gas-guzzling four-engine aircraft. 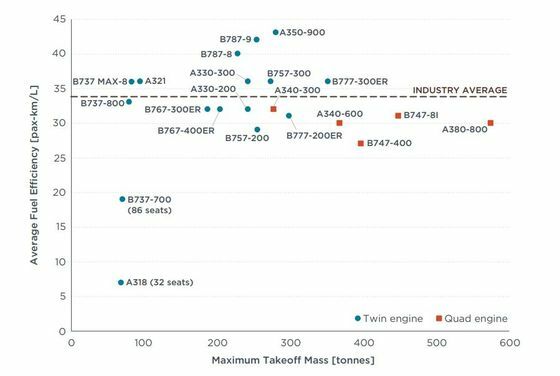 The results show that Norwegian flew a passenger 44 km (27 miles) with each liter of jet fuel consumed, while British Airways managed only 27 km (17 miles) per liter. Across the Atlantic, those carriers fly mostly the Boeing 787-8 and 747-400, respectively. British Airways, part of the International Consolidated Airlines Group SA, said the study reflects its larger share of premium traffic over the North Atlantic and that the carrier has improved its fuel efficiency by 10 percent in the past decade. The industry average was around 34 kilometers (21 miles), which was about the score of the world’s two largest carriers, American Airlines Group Inc. (33 km) and Delta Air Lines Inc. (34 km). United Continental Holdings Inc. was below the average, at 31 km per liter. The three U.S. carriers accounted for 39 percent of airline capacity over the North Atlantic last year; the Airbus A330 was the most widely deployed aircraft among the carriers the ICCT tallied, accounting for 25 percent of flights. Canadian airlines weren’t included because they don’t report the necessary data for comparison, the council said.